Filipino actress Elizabeth Oropesa will be showcasing her artworks at Hotel Albergo with Baguio Artists Roland Bay-an and Fred Agunoy on October 18. The 62-years old Multi-awarded Oropesa was famed in the 70s but never ceased to earn awards 'till the 2000s. But aside from her good acting, she is also holding a degree in alternative medicine. She recently retired from full-time acting to become a healer and artist. Known to have a third eye, she will be exhibiting her abstract painting with fellow abstract painters. The exhibit titled "North Meets South" depicts the birthplace of the artists: Bay-an and Agunoy coming from the North while Oropesa is from the southern part of Luzon, Bicol. Roland Bay-an who is turning 65 on October 18, is a veteran artist from Baguio and has been a resident artist of Tam-awan Village for several years. Many of the younger artists look up to this friendly master artist. Soft-spoken Roland Bay-an inspires promising young artists. He recently frequents Bookends Bookshop where he displays his arts along with young and promising artists. They are informally calling themselves Bookends Art Circle. They are also doing a sketch for a cause to help people in need. Along with Bookends proprietress Maricar Docyogen and several journalists, he started Pasa-Kalye, a street exhibit and gallery along T. Claudio Street. The Pasa-Kalye Street Art Exhibit is a regular weekend activity where Baguio artists can display their artworks and crafts. Fred Agunoy on the other hand, is an architect by profession. He was recently featured for his Duterte bike series created from construction and scrap materials like damaged door knobs, tire, shower head, and sink. Agunoy said he liked the macho aspect of Duterte so he made the series incorporating his knowledge in architecture with his arts. His main art, however, is impressionism like Bay-an using watercolor, acrylic and oil medium. After their exhibit at Hotel Albergo, Oropeza will be gracing another two-man exhibit by local artists at Fred’s Gallery. The exhibit titled "Tinalikdang Elementura" will showcase the works of Art Lozano and Allan Brilla. 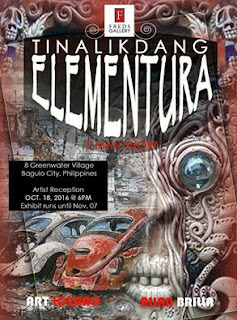 Art Lozano is a member of Tam-awan and also part of Bookends Art Circle. Allan Brilla who will be showcasing remarkable resin arts design is also a member of the Bookends Art Circle.